FORT WORTH, Texas (May 2, 2017) – Fort Worth’s newest nonprofit restaurant, Taste, has officially announced its pay-what-you-can restaurant located at 1200 S. Main Street will open on Tuesday, August 22, 2017. Taste Project, the nonprofit organization the restaurant is a part of, and its Board of Directors, encourage all Fort Worth residents to come show support for the underlying issue of food insecurity throughout Tarrant County at the grand opening of this award-winning restaurant concept in the Near Southside. Taste Project is a nonprofit organization designed to help feed, educate, and serve Tarrant County’s food insecure population, a total of 18.1 percent of Tarrant County’s overall community. pay what you would typically pay, plus a little extra. “Soup kitchens are good, but not everyone feels good about going there. We hope the recognition from the James Beard Foundation allows us to better reach the underserved hungry in our community with dignity, love, and respect,” said Chef Jeff Williams, founder of Taste Project. Taste received national recognition when Williams recently joined Denise Cerreta, founder of One World Every Body Eats, in accepting the 2017 James Beard Foundation Humanitarian of the Year Award on behalf of all 60 pay-what-you-can cafes across the country. 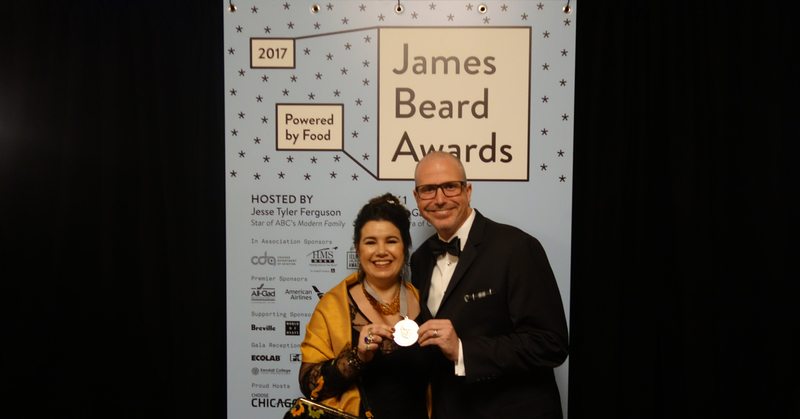 The James Beard Humanitarian of the Year award is given to an organization or individual working in the realm of food who has given selflessly and worked tirelessly to better the lives of others and society at large. Established in 1990, the James Beard Foundation Awards have been referred to as the “Oscars” of the restaurant world and showcase the country’s top culinary talent. Awards are given in numerous categories from chefs to restaurants, books, journalism, broadcast media, and restaurant design, as well as lifetime achievement and humanitarian awards. “We look forward to honoring the powerful work they’re doing to create a better food system,” said Susan Ungaro, president of the James Beard Foundation. Fort Worth residents don’t have to wait until August to begin making a difference in our community. Volunteers make this concept work, and Taste is looking for 500 volunteers before opening day to assist with hosting, seating, event planning, and more. If you are interested in volunteering with Taste, sign up at http://tastebud.tasteproject.org/. Taste Project (www.tasteproject.org) is a 501(c)3 non-profit established simply to feed people one community at a time. One of every six Americans faces the reality that they may not be able to provide for their next meal. There are programs in place that help; however, in Tarrant County, 36 percent of this food insecure population live above the poverty level and receive no government help. Our first project, a non-profit restaurant, will focus on healthy, quality meals made from local ingredients. Our menu will have no prices. This is a give and take concept. We ask customers to do one of the following: 1) pay what you can afford 2) pay what you would typically pay or 3) pay what you would typically pay, plus a little extra. To learn more, visit us at www.tasteproject.org or find us on Facebook. Founded in 1986, the James Beard Foundation’s mission is to celebrate, nurture, and honor America’s diverse culinary heritage through programs that educate and inspire. A cookbook author and teacher with an encyclopedic knowledge about food, James Beard, who died in 1985, was a champion of American cuisine. He helped educate and mentor generations of professional chefs and food enthusiasts, instilling in them the value of wholesome, healthful and delicious food. Today the Beard Foundation continues in the same spirit by administering a number of diverse programs that include educational initiatives, food industry awards, scholarships for culinary students, publications, chef advocacy training, and thought-leader convening. The Foundation also maintains the historic James Beard House in New York City’s Greenwich Village as a “performance space” for visiting chefs. In September of 2012, the Foundation launched the Diplomatic Culinary Partnership with the U.S. Department of State’s Office of Protocol and helped create the American Chef Corps as a way to champion American chefs abroad, promote American food products and foster an interest in American culinary culture and history through international programs and initiatives. For more information, please visit www.jamesbeard.org. Find insights on food at the James Beard Foundation’s blog Delights & Prejudices. Join the James Beard Foundation on Facebook. Follow the James Beard Foundation on Twitter and Instagram. In 2003, One World Everybody Eats began as a simple offering in a small café in Salt Lake City, UT. Owner Denise Cerreta noticed her patrons were struggling to make ends meet, and in what she describes as her ‘field of dreams’ experience, she decided to begin letting them pay what they could for their meals. She realized that one in six Americans—50 million people—are food insecure, meaning families and individuals are accessing emergency food pantries, even scavenging or stealing, to meet their nutrition needs. To address this issue, OWEE supports a model of pay-what-you-can Community Cafés that helps communities alleviate hunger at the local level. Since its inception, 60 cafés around the world have implemented the OWEE business model, including Panera Bread and the Jon Bon Jovi Soul Foundation for which Cerreta provided café opening guidance. Dozens of cafés are currently in development. Collectively, OWEE cafés have served almost 2 million meals, 30 percent of which are served to people of less means. Under OWEE’s business platform, each café is committed to serving appealing, nutritious, locally sourced meals with dignity to everyone while ultimately, changing communities and their perspective on hunger. For more information on OWEE visit http://www.oneworldeverybodyeats.org.